يشكل فندق Canberra Short Term & Holiday Accommodation بموقعه الممتاز في منطقة مطاعم ضمن المدينة، مكاناً ملائماً لقضاء العطلة بعيداً عن عجقة أيام العمل. يحظى هذا الفندق ذو 3.5 نجمات بمكان ممتاز يسمح بالوصول إلى المعالم السياحية الأكبر في المدينة، فهو يبعد مسافة 6.0 km عن صخب المدينة. إن سهولة الوصول من الفندق إلى المعالم السياحية الشهيرة الكثيرة في المدينة هو استثنائي بحد ذاته. يقدم Canberra Short Term & Holiday Accommodation خدمات لا غبار عليها وكل أشكال اللياقة وحسن الضيافة اللازمة لإسعاد ضيوفه. يقدم الفندق فرصة للاستمتاع بشريحة واسعة من الخدمات بما فيها: أمن على مدار 24 ساعة, خدمة غسيل ذاتية, تسجيل وصول/تسجيل خروج خاص, مرافق مخصصة لذوي الاحتياجات الخاصة, تسجيل وصول/خروج سريع . استمتع بوسائل الراحة الراقية في الغرف أثناء إقامتك هنا. بعض الغرف تتضمن تلفزيون بشاشة مسطحة, سجاد, مواد تنظيف, رف للملابس, قهوة فورية مجانية لمساعدتك على استعادة طاقتك بعد يوم طويل. يقدم الفندق خدمات رائعة كمثل حمام سباحة خارجي لمساعدتك على الاسترخاء بعد نهار طويل من النشاط والتجوال في المدينة. إن كنت تتطلع إلى إقامة مريحة وهادئة في المدينة، فستجد في Canberra Short Term & Holiday Accommodation بيتك الثاني. We'd pre-booked. We arrived at the entrance at 10:15 pm and it took multiple phone calls to contact someone who could give us access to the complex and a room number. We were provided with access to our room around 10:40. That's just appalling! A kennels would serve its clients better. My recommendation to others is 'Stay well away, there are better short-term accommodations in Canberra'. The location was good. Ease of transaction and access was very good. The bed was comfortable. The kitchen was convenient and plenty of seating. I realise the price possibly reflected the location but the shower rose was old and not working well. The tiolet buttons were missing, the globe in the bathroom was blown. The Venetian curtains were in average condition and no air conditioning. It is not bad accomodation and at the right price would happily stay there again. This was a good value stay except that for the first 2 days the shower barely delivered any water, while the sink had fantastic pressure. We disassembled the shower and removed various perished washers that were blocking the flow. This was an improvement, but there was never any hot water from any tap in the bathroom or kitchenette. 5 days of cold showers was not enjoyable. A shame. The accommodation with the kitchenette was handy. However the Wi-Fi was well below par, lucky to get 1 mbps, could barely handle emails and consequently slow browsing. Also the room didn't seem to be very soundproof as we had noisy neighbours one night. Not sure why the other reviewer had problems with the car park, as that was easy and always spots available. Very central for the National Museum of Australia exhibitions, and we found the accommodation easily thanks to the email which I received a few days before our departure. I was impressed by the voice mail left on my phone reminding me to download this info and the prompt follow up after we left the site regarding a message I'd left on the check-in card left in the room. 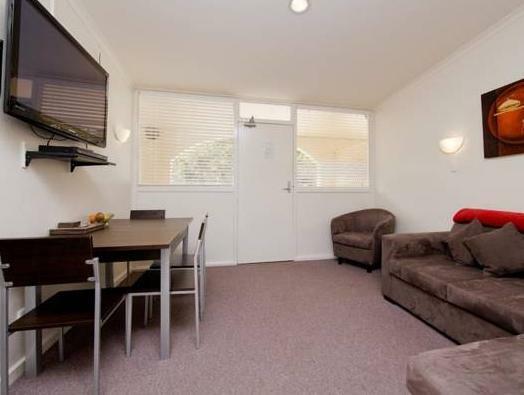 We ( 3 adults) stayed in a budget 2 room apartment, although the bathroom was very compact the rest of the Unit was just the right size. The kitchen had everything needed to prepare a meal. On top of that it was a quiet place to stay, away from the noise often associated with accommodation on a main road. Dirty walls and doors and everywhere Couldn't lock the front door! Couldn't close the toilet door! 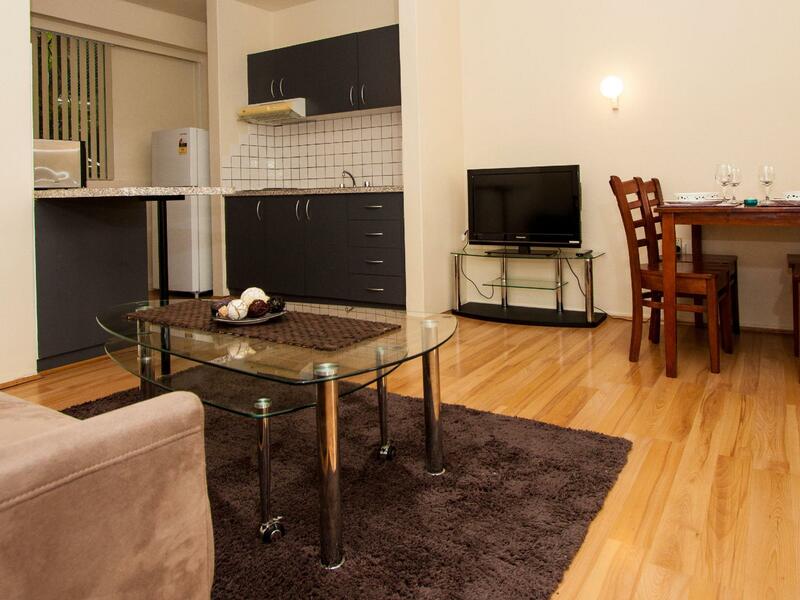 Really good, very affordable, clean, nicely presented rooms, close to Manuka and amenities. We needed assistance late at night and the staff were so nice - make sure you keep the door code on paper somewhere in case your phone battery dies. Thanks to all. Handy location and very good value as kitchenette was very useful and had sufficient for breakfast and simple meals. Impressed with how clean it was kept although some tired bits (like blinds) which needed repair. Did not see any staff but they responded promptly to our written requests. Could not rate food/dining as they did not provide any but it was a short drive to some great places to eat/dine. OK but no lift so a bit awkward lugging our stuff up the stairs to the first floor. Excellent. Proximity to family made the location perfect. The apartment was spacious and well appointed. The kitchen space was restricted by the awkward placement of fridge, freezer and a convection microwave and I would only rate the kitchen as 3 star. A smaller microwave mounted above the bench with a single fridge freezer and new hotplates would bring it up to 4 stars. However, the apartment was spotless and the staff accommodating. I will stay here again. This was a great place for a longer stay. The kitchen was well set-up and the room was a reasonable size. The location was quiet with only a little noise from other guests. While some places can be gotten to on foot from here it's far enough out of the centre of Canberra to offer more privacy and a car is an advantage (although it is close to buses). I would stay here again. Great value, clean and well equip with essentials and some comforts. The staff were easy to deal with which made the booking, check-in and check-out process easy. Everything was clean and in good working order. The bathroom and kitchenette were nothing fancy although had all the essentials and were perfectly clean.